Heinz and Cadbury are launching a London pop-up where consumers will be able to try a new joint-branded Creme Egg-flavoured mayonnaise. 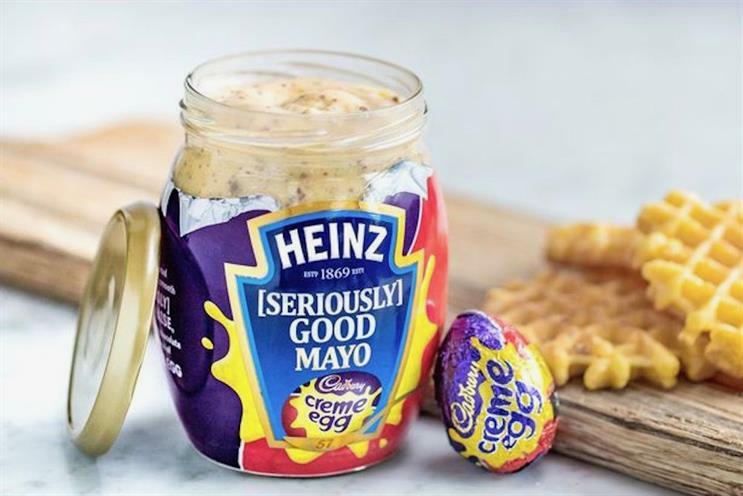 The two food groups, one distinctly savoury and the other sweet, have united to unveil Heinz [Seriously] Good Cadbury Creme Egg Mayo in time for Easter. It will be available to taste at a pop-up at east London's Old Truman Brewery between 11 and 13 April. Although the companies have not committed to rolling out the product nationwide, they said it was not inconceivable. The product is made using Heinz's free-range egg-based mayonnaise, which is then mixed with the "white" and "yolk" fondant used in Creme Eggs and chunks of chocolate "shell". Martina Davis, Heinz's brand manager of Heinz [Seriously] Good Mayonnaise, said: "We have had so much fun creating this unique Creme Egg mayo for Easter with our friends over at Cadbury – we absolutely cannot wait for people to try it. It’s unlike anything you’ve ever tasted before; a true taste sensation. If everyone loves it as much as we do, then who knows, we might have to roll it out nationwide one day. Watch this space."